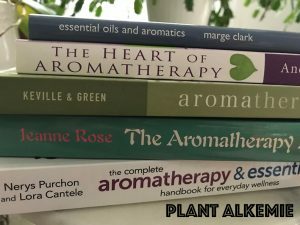 Aromatherapy Books For Beginners | Welcome to Plant Alkemie! Here is a list of aromatherapy books that I recommend for beginners. 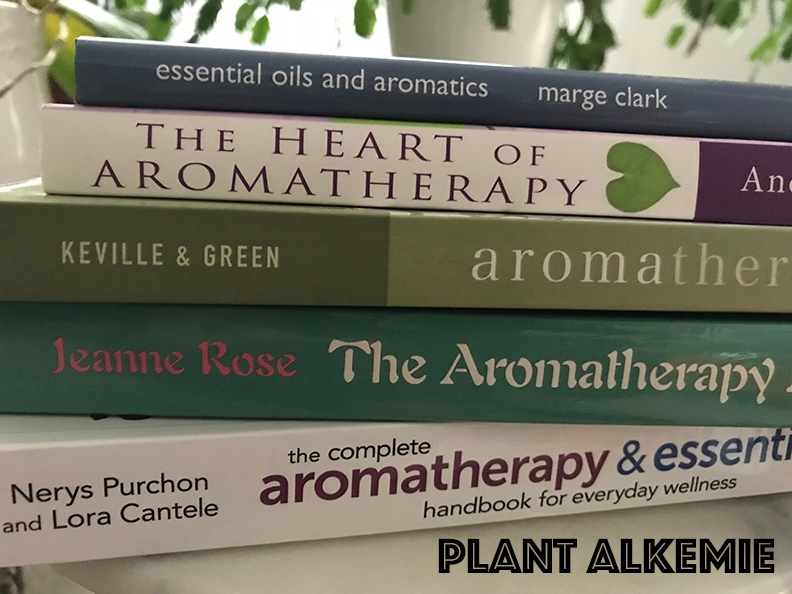 I also suggest these books for aromatherapy students and qualified professional aromatherapists, since the knowledge in these books form the basis of our field. I am only listing a few of my favorites, as my essential oil book collection is vast. There are other books I want to add to this list in the future! 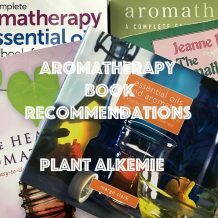 Every book is from an aromatherapist, including the aromatherapy pioneers, vintage (long time) aromatherapists, and respected qualified aromatherapists. I highly suggest only reading aromatherapy books that are written by aromatherapists and a few essential oil scientists. I do not recommend reading books from most essential oil companies or that do not list an author. These books are often a mix of a little bit of accurate information with a lot of misinformation, unsafe usage, incorrect properties, improper methods and dosages, and more: the majority of the information in them is inaccurate and unsafe. They usually do not take into account safety considerations, and many of their methods can cause serious adverse reactions and essential oil injuries over time. They are usually written by people with little to no authentic aromatherapy training. So I recommend reading books by qualified professional aromatherapists! I have listed recently published aromatherapy books as well as older books. I always recommend that people read both the newer and older books. Some people believe that it is best to only read the newer books since they think that the older books are totally outdated. But I disagree. While some things may need to be updated in the older books, there is a lot of valid and accurate information in the older books that isn’t found in any of the newer books. Though certain concepts (such as safety, in regard to pregnant women, children, and those on medications) have changed over the years, a lot is still the same (such as most usage, properties, methods, dosages, chemistry, history, background information, and more), and just because a book is older doesn’t mean that the whole book should be disregarded and thrown out. My plant knowledge comes from a variety of resources, including the older books. And I would not know as much as I do, if it wasn’t for both the older and newer resources! 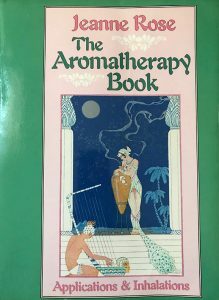 Reading the older books is like reading history and learning about the core of aromatherapy: these are the works of the aromatherapy pioneers and vintage aromatherapists. They are the ones that did countless hours of research and experimentation, and who figured things out. We owe a lot to these pioneers and vintage aromatherapists and their past work should be respected. In addition, every single authentic aromatherapy, natural perfumery, formulating, herbalism, ethnobotany, botany, and other plant related books that I have ever read (so well over two hundred plant related books) have had at least one mistake or difference of opinion in them. Every single one, old and new. So don’t discount the older books because you are going to miss out on a lot of great information if you do! As a general guideline, I always recommend that people read at least 5 to 7 aromatherapy books (more is better! ), cross compare, take everything with a grain of salt, take courses, ask the questions why and how, and learn from multiple authentic sources. It is best to cross reference the older resources with the newer ones for the most current safety standards, but I always recommend cross referencing multiple resources anyways (whether they are old or new)! I have linked the books to google books so you can view more information about the books. The links are not affiliated (I am not receiving any money from the links). Some of the books have a preview so you can take a sneak peek at the books. While for other books, there is no preview available on google books. If there isn’t a preview on google books, you might be able to view the book on Amazon’s, Barnes and Noble’s, or another book vendor’s websites. I have taken a picture of the cover of each book if I have the paperback or hardcover editions. I just wanted to mention if you get any of these books as an e-book (if they are available), then the publishing dates may be different than what I have noted below. The publishing dates on ebooks are not always accurate, because they are usually the dates of when the books were made available as ebooks, and they are not necessarily the dates of when the books were actually published. So newly released books will probably have the same publishing date whether you get the ebook, paperback, or hardcover. But a lot of the time older books may have different dates listed for their ebooks, even though it is the same book, and the ebook version is not a new edition. This is because the ebook came out years after the paperback or hardcover, so it has a newer date! And to add to the confusion, other times the ebook might really be an update or revision! So be sure to look at the copyright information to tell when the book was actually written and originally published! I will be adding more books to this list in the future! Any new updates will be listed in the ‘what’s new‘ section, and if I edit this article, I will add an ‘updated’ note in the title. Please note: there are many other great aromatherapy books (like Tisserand’s, Sheppard-Hanger’s, Worwood’s, and Rhind’s work) that I highly recommend but they won’t be listed on this particular list. They aren’t beginner books so they will be listed in my future intermediate and advanced/practitioner level aromatherapy book articles. I hope that you have fun learning about aromatherapy and essential oils! 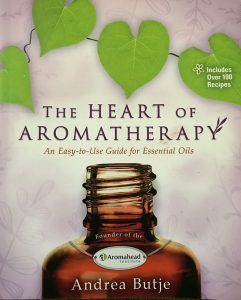 The Heart Of Aromatherapy is a great beginner book! The Heart Of Aromatherapy (2017) by Andrea Butje. Andrea Butje is an aromatherapy pioneer. This book is great for people who are totally new to the field. It is a good general overview that has essential oil profiles, carrier profiles, recipes, Andrea’s stories about her experiences with distillers, and stories that highlight the essential oil’s properties (she gives the aromatics human personas to explain what they do!). I like that she offers adult and children friendly versions for each of the recipes. One of Andrea’s main focuses is essential oil safety, so she is a great resource for that! 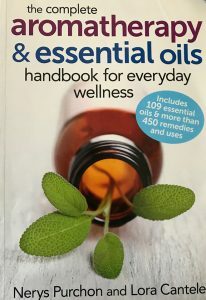 The Complete Aromatherapy & Essential Oils Handbook for Everyday Wellness (2014) by Lora Cantele and Nerys Purchon. I really like this book; I recommend it to beginners and aromatherapists alike. I usually would put this book in the intermediate category but this is one of the books that is often recommended the most to beginners. Purchon was an Australian aromatherapy pioneer, and Cantele is a vintage U.S. aromatherapist. Cantele greatly expanded Purchon’s work, and she has provided us with an excellent resource. This book covers essential oil safety, essential oil profiles, carrier oil and butter profiles, and recipes. It is a huge book (480 pages) and covers a wide range of conditions and remedies, including essential oil usage in children, skin care and skin issues, women’s health, and many other basic to advanced health concerns. When Cantele was writing this book, she had an advanced copy of Robert Tisserand and Rodney Young’s Essential Oil Safety 2nd edition. And she took their safety guidelines into account. A wonderful little guide to essential oils! 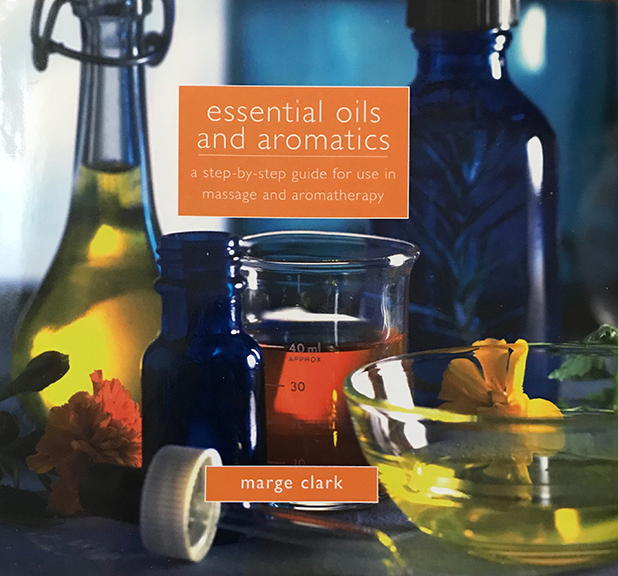 Essential Oils and Aromatics: A Step-by-Step Guide For Use In Massage And Aromatherapy (2008, kindle edition is revised 2013) by Marge Clark. This is a great book from aromatherapy pioneer Marge Clark. It is a beautiful small book (it is 95 pages) that is jammed packed with information. It covers the basics and it includes mini essential oil profiles, mini carrier oil profiles, safety concerns, and recipes. There is information on aromatherapy for the mind and moods, massage, baths, skin care, pain, and for the home. It is a good introduction to the world of aromatherapy. 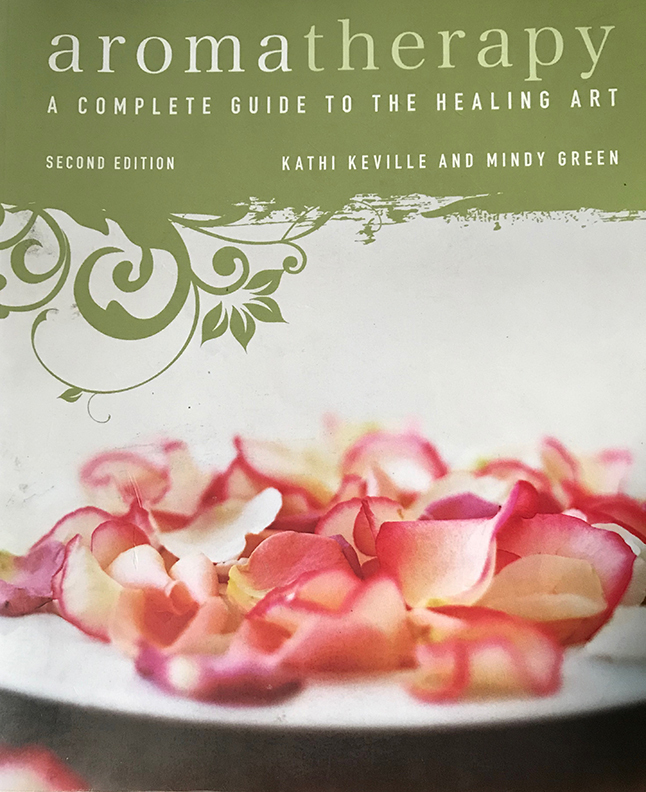 Aromatherapy: A Complete Guide To The Healing Art, 2nd edition (2009) by Mindy Green and Kathi Keville. Mindy Green and Kathi Keville are pioneers in the fields of aromatherapy and herbalism. Their books have greatly influenced me as an aromatherapist and herbalist. This book is one of my most favorite aromatherapy books. It is an excellent general guide that covers many different topics, such as essential oil profiles, aromatherapy for different skin and health issues, natural perfumery, extraction methods, chemistry, Ayurvedic inspired aromatherapy including the chakras, useful charts, and essential oil safety. Since they are both herbalists, some of the recipes have herbs in them too! It covers a little bit of everything! I would probably categorize this book as an intermediate level book, but this is the book I usually recommend the most to beginners! Be sure to get the second edition, as it is greatly expanded and contains much more information than the first edition. The first aromatherapy book I ever read! The Aromatherapy Book: Applications & Inhalations (1992) by Jeanne Rose. Jeanne Rose is an aromatherapy legend. When modern day aromatherapy history is discussed, three people are always mentioned, and one of those people is Jeanne Rose. This is an older book but it has a special place in my heart since it was the first aromatherapy book I ever read (over sixteen years ago). Whether you are new to aromatherapy or an aromatherapist I highly recommend reading this book. It has a lot of interesting information and a huge list of aromatherapy and natural ingredient suppliers, but please note that some of the listed suppliers have either gone out of business or have changed their contact information over the years. In the beginning of the book, there are charts listing different conditions, as well as essential oil profiles. There is a glossary of terms (definitions), several tables and charts, a chapter on distillation including how to make a home still, skin care information, and history. This book covers basic usage and has some recipes in it too. This is one of our classic books of aromatherapy. I love this article Li! You’ve done a wonderful job providing wise guidelines and insights regarding research methodology, as well as excellent criterion to consider when purchasing aromatherapy books. Actually, I only have one of these books, but now that I’ve read how much you love the others, I plan on adding the rest to my collection. That Jeannie Rose book was also my first aromatherapy book! I think I got it in High School or College, at least thirty years ago. I remember how much it inspired me and how much comfort it brought me. Somehow, I’m no longer in possession of that book, but will treat myself to a new copy soon. Regarding, “The Heart of Aromatherapy,” I also love the fact that Andrea includes kid and adult versions of all of the recipes. Great feature, not only for those who want to blend for kids, but also for those who want to blend for sensitive adults. The Heart of Aromatherapy book exposed me to several interesting and versatile essential oils, some of which have become my favorites, such as Pinyon Pine and Black Spruce. It seems like Andrea put a lot of thought into which essential oils would be featured, so as to not overwhelm people. It’s nice that she provides so many recipes which include only the oils profiled in the book to keep things simple and relatively affordable. Because my eyesight is weak, I really appreciate that the font is large. The lavender font, smooth textured pages and illustrations are wonderful touches which enhanced my experience of reading this book further. It was nice that the pages didn’t have that chemical odor that many new books do these days too. Looking forward to reading your upcoming articles! Thanks for your sweet thoughts Angie! I am glad you have read Jeanne’s book too! Wow, you read it such long time ago! I hope you get a new copy soon! Yes, I love that Andrea had adult and kid recipes too. That is great you discovered some other essential oils that you love because of her book. Have a nice day! You’re more than welcome Li! Yep, I’m old. This is true. I was also always a huge fan of natural aromatics though. While my other friends in middle school were wearing lots of volumizing hairspray, I was wearing essential oils. Later, when I transferred to a High School for the Arts which was located on a college campus, it was easy for my fellow classmates to get away with smoking during breaks. I did things a little differently. Whenever they smoked cigarettes in my presence, I pulled a stick of incense out of my backpack, used dirt as an incense holder, and burned it in a lame attempt to counterbalance the second hand smoke. At the same time though, I was also trying to help them camouflage the cigarette smell so they would be less likely to get into trouble later. Anyway, I sent a copy of Andrea’s book to my best friend who lives in Israel. She has eight kids, three grandkids, and is the head nurse of a special needs school. She absolutely loves the book and this made me really happy. I am glad you have always been a fan of natural aromatics, Angie! Great story, thanks for sharing! And wonderful that your best friend loves Andrea’s book! Have a nice weekend! Thanks so much for this list. So helpful. Having included why you recommend these particular books is a big help. Thanks for putting the time into it. Thank you so much for your comments Linda! I am glad you enjoy my book list! I will writing more book list articles in the future. Have a great night!